I drove four-plus hours yesterday to bring my son home for spring break. On my way out the door I realized that I hadn’t eaten breakfast, so I quickly assembled a PB&J, as well as grabbing a banana and water bottle. He and I did stop at McDonald’s to splurge on Egg McMuffins as their app had them buy-one-get-one-for-a-penny. We also hit Costco midway for cheap(ish) gasoline. Nothing too earth shattering, but it did save money over eating in a restaurant. I ended up bringing our minivan instead of the Prius as it was raining after a dry spell and I was feeling paranoid about safety. I knew I’d be pooped last night, so I threw some chicken drumsticks into a down and dirty Asian-style marinade before I left the house. Based on this recipe from Struggle Meals, it’s a big hit at our house. Sure I added powdered garlic powder and ginger as I was in a massive hurry, but there were no complaints and it kept us from eating takeout or other random stuff. Although this recipe has to be assembled ahead of time, the hands on prep time is just a couple of minutes. I’d love to take the family on a fabulous trip for spring break, but it’s simply not in the budget. Instead, I’m planning at least one cheap diversion per day that gets us out of the house to enjoy Portland and her surrounding area. For example, a local second-run movie theater has 2-for-1 admission on Tuesdays, which makes it an affordable activity. (Hello, $2 movie tickets!!) 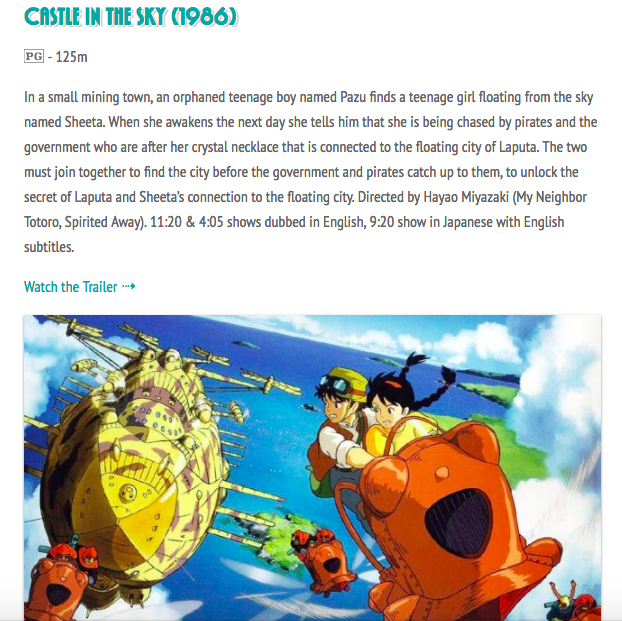 And since they’re showing Hayao Miyazaki’s Castle in The Sky, this one’s a no brainer. I do plan on spending out a bit in other areas, but strategically. I sold a vintage telephone and sauce pan on eBay, my husband and son are going to a free minor league soccer game tonight, I walked to the grocery store for milk, I’ve spent no money on anything other than food/groceries for at least a couple of weeks and I created a cat bed using towels I sourced from a free pile. I love how totally unpredictable your posting pattern is! My guess would be that the posting pattern has a lot to do with Katy’s unusual schedule (her nursing shifts, the kids’ college vacations, etc.). Whenever she can get to it is fine with me. A. Marie my comment was genuine and honest. I really love it being unpredictable as this makes me believe she posts because she enjoys it and not because of a schedule or something else! And I love surprises and a new post here always feels like a small surprise as I never know when it will be here. There is another Castles in the Sky, made about two years ago and starring Eddie Izzard (sp?) about the race to develop radar as the Nazis were preparing to bomb the coast of Britain. It is on Amazon Prime. A neat film if you are into that nerdy or historical stuff. It’s nice that you are posting so frequently. BTW, PB&J on GF bread and a banana make up my favorite on-the-go breakfast. 1) Enjoying super frugal weekend activities- March Madness, gardening, and long walks with the dog and hubby. 2) A dear friend gave me a small, table-top antique display case that needs a little work. I am cleaning it up and doing some restoration this weekend. I will line it with velvet that I have in my fabric stash, and I will use it to display more valuable smalls at the vintage sale that I am participating in next Saturday. 3) I updated our spreadsheets that I use to track our expenditures. I am proud to report that the only thing that I purchased last week was food. No thrifted items, no dinners out, nothing at all. 4) The weather is lovely. The AC and heat are off. The windows are open. There really is nothing better than fresh air. 5) I am doing all the usual things- drinking primarily filtered water, brewing my own coffee, cooking from scratch and eating at home yet AGAIN. I am feeling a bit restless, and I don’t want to cook anymore, never ever again. However, I am digging deep and doing it anyway! Sometimes being frugal doesn’t feel fun. Fry that sandwich and you’ll be just like Elvis! Your #5…I get it about the cooking. Those are the nights I pull out the frozen store brand pizza. It’s not easy being frugal sometimes. Having that day today. Ugh. Threw some black beans in the crock pot – I think we’ll probably end up with roasted cauliflower and black bean tacos, based on the current contents of the refrigerator. Meanwhile I cannot get the fabulous Indian restaurant near my mom’s house out of my head . . . Sigh. Frugality is not for the faint of heart. 1. I walked in my neighborhood. It is 72, sunny and very pleasant. 2. I have yet another murder trial that starts on Monday. I will wear thrifted clothes and they look fine. 3. I cleaned my house. I cannot think in a messy house. 4. I bought a counter top burner for 10 bucks at Walmart. A new stove is not in the budget at the moment. Besides, the oven in my free stove is still going strong after 7 plus years. 5. I took a nap, which is always my fav. Y’all are my soulmates! Love this site! Assistant district attorney is what we are called here. Some jurisdictions use the term “prosecutor” but it is the same thing. I am approaching retirement. I am old…lol. Some of these posts are so funny! I have to admit I wondered too when you said “another murder trial…” but quickly assumed you are an attorney. Whew…glad to heat you are…somehow Serial Cindy facing yet another murder trial just didn’t make sense!!! LOL!!! I’m curious where there’s a minor league soccer team in the Northwest. I didn’t know there was one. I love minor league games. 1. I’ve been making bowls for dinner — a grain base with hot and cold veggies and a protein on top, with pickles and herbs. Tonight it was couscous with chard and bacon, with my homemade pickled peppers and some fresh cilantro on top. I was going to add a poached egg on each, but the eggs I got from my chickens were bad. I had floated them to see if they were all right but these turned bad pretty fast. So no eggs. 2. Meanwhile, I have another dozen or so eggs, and I’ll be sure to float them and see if they are all right (bad eggs float because they are full of gas; fresh eggs stay at the bottom of the washtub). These are “free” eggs because my hens eat table scraps and bugs from the neighborhood. 3. I got snacks for my upcoming trip to Portland; gum and some dried fruit, etc, to take along for the trip and in between meals. A trip to the grocery store included pre-planning meals for my husband (he’s disabled and can'[t stand for very long, so he doesn’t cook or do dishes); I got a bunch of frozen foods for him that were reasonably priced (not the cheapest but not the priciest, either). 4. I gave away a bunch of chicken wire to a guy via Freecycle, which cleaned up my garden area. My garbage company will take paper bags of yard waste (large yard-size bags) for no charge, so I am slowly filling a bag with blackberry vines. 5. One of our daughters is borrowing one of our cars while I’m gone on my trip; her car is being repaired by a friend. Good to have handy friends! I just started freezing eggs. I’d tried in the past, but they stuck to the ice cube tray, and I couldn’t get them back out and things were unhappy in my kitchen. I tried freezing them in silicone cupcake holders and it worked like a dream! If you have too many eggs from the hens, try freezing them! My husband defrosted a couple this weekend and scrambled them for breakfast and he said they were fine. I’m so excited to be able to have free eggs this winter, when the hens stop laying! Did you try spraying your ice cube trays with Pam before freezing? I have had good success this way. 1. My daughter and I have been eating very lightly while hubby’s on this work trip. He will be home tomorrow. Told me he has a couple of dinners out next week so daughter and I will be cleaning out the freezer. 2. My son, who lives in Singapore, called me on my newish smart phone using a free app called Whatsap. Hubby and I get to see him and he gets to see us. So very cool. 3.Gathered together some curtains and something else fabric like to go in the trash. No one would want to use it. I’ve started another Goodwill bag. 4. Did my errands on Friday in a nice circle that encompasses our 2 square mile town. Went to grocery store, drug store, bank, library and dry cleaners. I’ll have to figure out a reason to go to Costco – about 4 or 5 miles away – so I can get some cheaper gas. 5. Enjoyed the peace and quiet that is home. 1. Made my husband sit down and review our budget. He’s always happy to follow a budget but not good at creating them. He sat for an hour and we sorted it out. Made a savings plan. 2. Made pancakes from scratch for breakfast. 3. Harvested another free pumpkin. Had it for dinner two nights in a row. 4. Invoiced for some freelance work I’ve done. I’m very good about doing the work and hopeless about sending the invoices to get paid. Crazy! 1. My brother came over and got my generator running as well as my power washer. Neither have been run since before my husband passed away. This saved me from hiring the job done. 2. My daughter backed into a tree with her car. It put a big dent in the bumper and smashed the tail light. Instead of filing an insurance claim and paying the deductible of $1000 I just had the taillight replaced and we were going to live with the dent. My brother poured boiling water over it and popped the dent back out. Hundreds of dollars saved. 3. Daughters and I had dinner at my Mom’s last night. My brother grilled burgers. It was a nice time. I will probably take both my Mom and brother to dinner to thank them for their help. 4. I had to buy a new battery charger for my cars, tractor etc. The old one had a frayed cord and was dangerous. I will dispose of the old one at Hazardous Waste facility. I bought the new one during Menard’s 11% off rebate sale so I will at least get a few dollars back. 5. I took my daughter to the library and am reading a free library book on my kindle. I also picked up my taxes that were done by a friend. She charges me much less than I would pay elsewhere. 1.My ebay is picking up, I’m paying more attention to what brands I own and using comparable pricing. Sold two things this week, gifts that were brand new that I never used. 2. Still eating the turkey rice soup, that was my breakfast this morning. 3. Being intentional about what to sell and what to gift. Today it is a beautiful blouse that doesn’t quite hang right on me. Would sell for about $15 but I’m taking to a friend today to see if she wants it first. 4. Helped a recent widower clear out and organize some of his late wife’s items. He took us to dinner to thank us. It was weird that she wasn’t there with us, you know? 5. Found a hair dryer on a good sale. I’d been using mine, even though after 2 minutes the plug falls out of the wall each time. Really annoying but I was stubborn enough to wait until I found a good sale with a rebate to replace it. Last weekend was my grandfather’s funeral in the SF Bay Area. It was a beautiful event, well attended by friends and both sides of my family. The focus was not on frugality (of which my grandfather was a big fan) but on family (of which he was an even bigger fan). 1. My parents generously gifted my brother and I and our families hotel rooms for the weekend. They developed a relationship with the hotel as they’ve stayed there a few times over the years. They explained the situation to the staff and were given discounted rooms, green snack bags, and free parking for all of us. We made a plan to spend our family time together at happy hour and free breakfast. 2. The next day, we made the drive to the coast for a gorgeous 70 degree day, to relax and reflect. My son is currently into photography, so the colorful sights at the pier were delightful to him. 3. My husband’s family favorite restaurant is hardly bigger than a fishing shack, so the wait for a table would have taken a big part of the time we had. We opted to get our food to go, saving on time and tip. We enjoyed a delicious meal literally feet from the boats at dock and a picnic table in the sun. We were so full from lunch we didn’t need dinner. 4. The other place we visited was a state beach with tide pools, so no parking or admission fees. I’m so sorry about your Grandfather. It sounds like his funeral was exactly the sendoff he would have wanted. You take care. (1) The bronchitis fun continues: Both DH and I have been coughing our heads off and dribbling like mad dogs. We’ve been retooling our schedules accordingly (mainly to avoid passing the joy on to the general public). But we’re making progress, and I think that DH (who got it before I did) will be recovered enough to resume his cognitive care programs tomorrow. (2) We did run two errands today. The first was to return a 4-pack of LED light tubes to Lowe’s that, despite the claims on the package, simply did not work in our old fluorescent ballasts. $21.58 saved. (3) The second was to the annual 25% off sale at our favorite secondhand bookstore, where I bought a beautiful, just-well-worn-enough Folio Society set of Jane Austen for my JASNA BFF. She’s been soldiering on with a set of lousy paperback versions for years, and as her Belligerent Fairy Godmother, I’m determined to give her an upgrade for her next birthday. (5) Finally, DH is developing a very good eye for coins on the ground: He’s found all of our most recent pennies. Surely this counts as some form of cognitive exercise? I quite like “Belligerent Fairy Godmother ” and may appropriate it if you don’t mind! I believe scouting the ground for change is a great cognitive exercise, as well as the walking. I have read that exercise slows down the progression of dementia. Best to you and DH! We are on Spring Break as well. We are mostly staying home and everyone is working more at their extra jobs. Dh reffing lacrosse, my “volunteering” at the professional sports stadium, dd picked up extra shifts at her birthday party gig. 1) Dd has been rejected from 6 schools and we are left with only 2 options – both have not offered her enough money and both schools we have never even been to, they were last minute add-on safe schools. We are taking a last minute trip to Indianapolis to visit one of them. I used my Hotels.com reward of a free night. $18 in fees later we have a hotel room for our trip. Hotel offers free breakfast. The college is providing free lunch. 2) We are appealing the financial aid package at said school in hopes of making it more affordable. 3) College age ds needs to retake a class that he got a D in and he needs a C for his major. He is enrolled for summer term. I will not pay this and he has been told to work more to cover it. I won’t pay for a redo of something he should have passed. I am paying way too much for college as it is. He can take it extra in the fall if he doesn’t have the money. 4) Noticed 3 bananas had been hidden under a towel accidentally and were past their prime. Mashed them up and made banana muffins for snacking and breakfast. 5) Gave the dog a bath at home. Used a free reward at Starbucks. Got $5 in tips at the sports event last night. Sold an essential oil to a friend that I wasn’t using. Got a $5 ECB from CVS Pharmacy from filling prescriptions. I totally agree with your #3. My son failed a class and had to pay us back for it. Good luck with the college search. My daughter just accepted an offer. 1. I made a big pan of chicken and rice, It was lunch today and will be dinner a couple nights this week. I also made a batch of buckwheat granola (gluten free and oat free) and two loaves of gluten free pumpkin bread. Hello breakfast and lunch food. 2. My husband wanted to go to “cheap” Ollie’s for something he saw in their ad. I rolled my eyes and went with him. I scored sunflower seeds for $2.49/# and some organic fruit at a good price. I also found a few birthday gift fillers (Star Wars liquid soap dispensers). 3. The ice cream “stand” that shares a parking lot with the yoga studio I attend classes at opened a few weeks ago. Today I found a quarter in the parking lot and $.11 the other day. 4. I looked at rental car rates and saved over $70 by re-booking (making a new reservation and cancelling the old) for an upcoming spring wedding trip. Rates are constantly changing. 5. I booked a summer trip, to see far away family. By flying to a different airport we’ll save hundreds of dollars. By signing up for emails I saved 10% on the hotel rate (which I can unsubscribe from later). 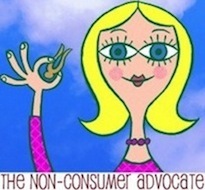 Most of my recent frugal successes revolve around food , but did have one frugal shopping score, will start with that! 2. Scored 15 large avocados for $3, beautifully (ver) ripe. Came home and googled to see if I could make guac and freeze it and the answer is YES! So I have 4 large portions of guacamole in the freezer, will report back on how it is when we thaw and eat some! 3. Made dinner all 3 nights this weekend, making a point to use lots of tired and near tired produce. All dinners were tasty if I do say so myself! 4. Decided to make banana bread to use up all the bananas I’d thrown in the freezer one at a time when they got too ripe. Made 3 large loaves, gave one to my mom, we ate one and I froze one. 5. Spent no money on entertainment this weekend (although I did meet friends for dinner Thursday night). Went for a run with friends Sat am, did lots of cooking, laundry etc., watched a good new show on Netflix, went to yoga, read a library book, enjoyed the sunshine, life is good! Sometimes I buy Wholey Guacamole and toss the whole package in the freezer. It defrosts perfectly, so you should be happy with the results! I recently found a good deal on avocados (not as good as yours!) and cut them in half and froze them that way. They defrost a little soft but are great for smoothies or getting mashed onto a sandwich. 1. Pillaged our church rummage sale at the end of the sale. I got a bike, some special occasion clothes and a ton of books for the shop. They were just grateful at that point for me to take them away! 3. Finally discovered a way to freeze surplus eggs for the winter. They even cook up ok, so we can use them for more than just baking. I will be freezing a lot of eggs this spring! I used the silicone cupcake cups, and they pop right out. Unlike the ice cube tray that viciously held on to my eggs until I used a knife to dig them out, half-defrosted. 4. Reconfiguring dinners as I will be at the kids’ school until 5 three days a week; my daughter leaves for swim at 5. I need to have something ready for her to eat before she leaves for swim or my husband will succumb to the song of the burrito shop. OTOH, another mom offered to bring my daughter to her swim meet an hour away while I’m volunteering at the school on Tuesday, so that’ll be better. 5. Appreciating the sun to do laundry, open up the house and air it out. My desire to contribute to the comments on the posts (which are always highlights in my week) made me more mindful about the frugal things I was doing. Which makes it more fun! 1. I’m slowly letting myself get into the pantry reserves we keep through the winter in case of surprise snowed-in days (one of the drawbacks/perks of living on the side of a mountain) as we are moving into warmer days. Thanks to that, the week’s groceries for two people was only $18. We’re set for breakfast, lunch, and dinner! 2. I added to the freezer’s reserves of vegetable stock. I make it regularly with vegetable scraps. 3. Slowly warming days means turning down the heat even more. I keep the house pretty cool in the winter but I can’t wait to turn off the heat completely. 4. I spent Saturday morning sewing up a new shirt using a pattern I already had and fabric I had left over from another project. I’m wearing it at work today and I’d be lying if I said I wasn’t strutting around a bit. The joy I get from wearing the clothing I make isn’t something that can be purchased. 5. The spouse and I spent our date night at a dance performance at the local university. We get discount tickets because the spouse is on faculty there and the money we do spend goes to support arts education. Plus we don’t have to drive to the big city to enjoy excellent performing arts. Katy, does the cat urinate on the sofa after your kids come home for awhile? The cat may not think they smell like they used to and could be expressing disapproval or marking territory. 1. Taught a co-worker how to drive, for which she will repay me with a couple of breakfasts at our favorite diner. It was fun and now she is free from having to pay for Lyft or Uber. 2. Bought some discounted pasta and sauce mix at the bread outlet store and jazzed it up with some ground beef and sweet peppers and onion from the freezer. It made plenty for lunches this week at about a dollar per generous bowl. 3. Also made banana bread, using up some brown bananas, and a gallon of home brewed tea to take with my lunch. 4. Bought four adorable shirts for a friend’s fast-growing little boy at thrift shops, paying between $1 and $3 each. 5. Received some grocery store coupons that knocked $10 off the last shopping trip. 1. Got a 2 free yogurts from my grocery store’s app and a free mini hand lotion from Bath & Bodyworks. 2. Took my son to a few free events over the past two weekends…he made St. Patrick’s Day slime at Michael’s and some “The Very Hungry Caterpillar” crafts at an event at our local library. 3. Sold 2 items on ebay for a profit of $17.38. Reused boxes/envelopes/bubble wrap I had on hand. 6. My husband changed the oil in his car and is planning to do mine in the next couple of weeks instead of taking it somewhere. 7. I’ve been using up things buried in the freezer including a bag of pierogis, half a bag of french fries and some hamburger buns. 1. Unlike my frugal fail last week, I remembered to take my leftovers from my banquet serving gig this week. If there is an event and the attached restaurant is not open the next day, they throw all the food out. I took a full takeout container of veggies and one of chicken and pasta. Lunch all week! 2. BF brought some of our old ski gear in to a sports resale shop. Not much, but my old skis and boots fetched $25. He got chastised for not bringing the things in at the beginning of the season because we could have gotten a better price, but considering our upcoming move/downsizing efforts I was happy to get any money at all. 3. Spent a nice Friday night in cleaning out closets. Doesn’t seem like much fun, but we got to tell each other stories of the clothes we were donating and learned a little more about each other. Closet is much clearer of clothes we don’t wear, all our foldable things now fit into one dresser, and we are that much closer to moving out. 4. Banquet serving job is heating up with more events on the calendar as the snow melts. The extra $70 or so a shift adds up and covers some living expenses that otherwise would be stressors. 5. Had a really awful week and opted to go skiing on the way to see my nephew in his school play to clear my head. It was the member day for our health insurance, so my lift ticket was half price. Much happier paying $42 than $86! Hi Katy, just heard about your website on the “How to Money” podcast on my (free) nature walk and first thing I did when I got home was to look you up. And what do I see? “Castle in the Sky”!! 2. Packed a PB&J in a washable reusable cloth zipper bag for my post walk snack so I don’t accidentally end up at Panera. 3. DIY’d a cat bed out of a freebie sweat shirt for our newly adopted (also free) cat. 5. Made my own soy milk at home. Just got home from what felt like a super-un-frugal long weekend at the beach, but when I look at the actual numbers, it wasn’t that extravagant. March is just a looooong month, and the next tuition payment due the first of April makes it feel even longer. 1) Packed a big portion of delicious stir-fry with extra vegetables and homemade peanut sauce to hand directly to college-student son when he climbed off the train late at night so we could drive straight to the beach without a stop for a snack. Nine of us converged from 7 directions over the course of the weekend, but we kept it to 5 cars, which is a new record believe it or not. 2) No paid activities over four days – lots of long walks in the gorgeous weather, which was warm enough that we considered dipping our toes in the surf. Then got caught in a “sneaker” wave and found ourselves wet nearly to the waist without meaning to be. Glad of the Grocery Outlet $3 stacks of firewood I brought with me to dry out after that. 3) Divided and conquered on some unpleasant maintenance tasks in order to meet the 8-hours per day work requirement for the IRS so these days don’t count as “use” but as maintenance in our little beach place. Among other things, all of the outdoor furniture was ruined over the winter – we suspect by renters, but the property management company denies any knowledge, per usual. Hubs loaded it up along with some broken curtain rods to take to the dump. By pulling a few odd pieces off of the rods and the chairs, he was able to count the whole load as scrap metal recycling, which meant it was free. Otherwise, it’s $13.50 to drive in the door plus a charge for weight. 4) Made all meals at home, though supplemented one breakfast with a box of pastries from the lovely nearby bakery. Couple of daughters walked to select them, then brought home fewer than usual when they realized that carrying several boxes would be complicated. 5) Since we were at the beach anyway, took a day trip to a remote stretch an hour away where my mom has inherited a gorgeous but difficult to use piece of property. If I were a gazillionaire I would definitely put in the work to make it habitable, but since I’m not, we walked the bear trails (really!) to try to find the property corners, took a lot of pictures, met with a realtor, and wished him luck in finding someone who can do with it what we only wish we could. 1) Took my lunch to work all week, but have succumbed to the siren song of takeout coffee while at work. Today I really wanted to buy a latte but I made coffee at home. 2) Played volleyball with coworkers last night. A free and fun way to socialize. 3) I really want to buy pretty summer work sandals. But I took my old ones to the shoe repair shop to get fixed and resoled. 4) Shopped the grocery store clearance rack and bought some very lovely bath and body care items that will be gifts. 5) I really don’t have a number 5!! I’ve been spending lately instead of saving.